Heat resistant type of Type KCP flexible conduits:usable temperature from +30°C~+130°C:suitable applications in the places of high temperature and humidity:the same connectors as Type KCP flexible conduits. Wound metal conduits with engaged profile made of high grade steel strip, with yellow heat resistant vinyl sheathing. 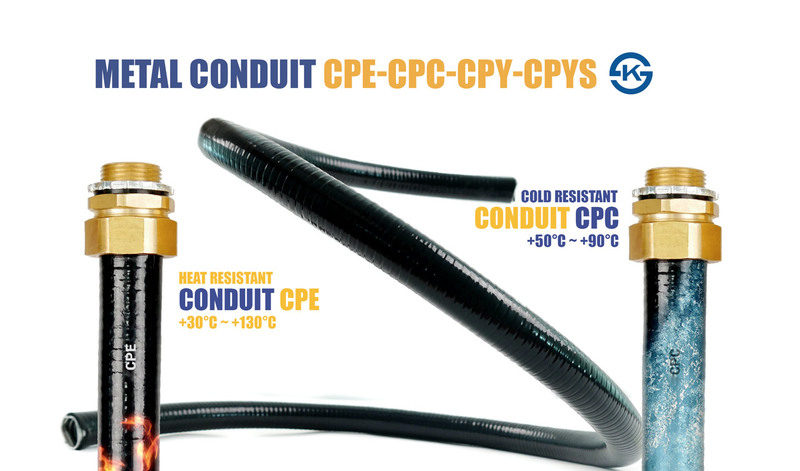 Cold resistant type of Type KCP flexible conduits:usable temperature from -50°C~+20°C:suitable appiications in the places under 0°C, the same connectors as Type KCP flexible conduits. Wound metal conduits with engaged profile made of high grade steel strip, with black cold resistant vinyl sheathing.